Based on my previous comic review of Cowboys and Aliens I received feedback from @existopher on Twitter that his kids liked Zita the Spacegirl so I decided to check it out. Let's dive in. 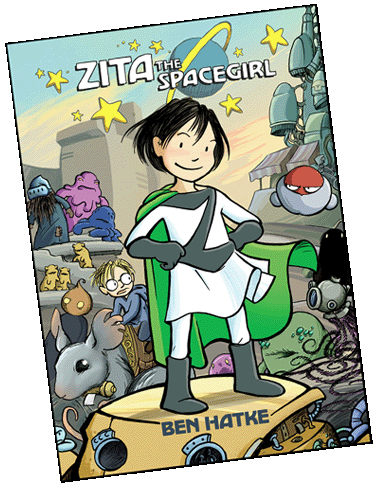 Zita the Spacegirl is drawn and written by Ben Hatke. He is a comic artist and has a sketch blog called Art and Adventure. I really love Ben's drawing and colouring style, especially for kids. The art is very approachable and the scary stuff not too dark and scary for a kid. Unlike some stuff I read, I would not be concerned to leave this comic out where the kids might pick it up. What I really enjoyed about the first book in his series is the open and inclusive nature of the lead heroine, Zita. She approaches each person/alien she meets with an open attitude and looks for the good in them. This does not always workout for her but she quickly builds a team of friendly and helpful companions that help her on her quest to rescue her friend Joseph. This is a story about being lost, finding friends, saving the world, and sacrifice. A fun story for kids and adults alike with some nice themes throughout. There is suspense, bad guys (the normal dumb ones doing dumb things that kids like), adventure, and lots of funny aliens to enjoy. I liked that the lead is a girl who is cast with strong instincts, technical savvy, and daring fit for a Captain Kirk adventure. You can see that Ben loves his (kids) girls in the writing as he crafts a story with such a strong female lead. There should be more stories like this that I can point friends to when they are looking for a strong, non-sexist female heroine for their kids to read in comics. This is a comic I recommend if you have kids. My 8 year old read it on his own while my 5 year old and I read it together. They both enjoyed the story. Online I found recommendations of ages 7-13 for this book. So, follow that guidance and give it a read first (like I did) to see if you think your younger child can handle the story.